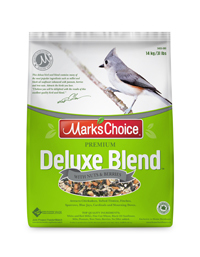 This quality bird seed blend does not contain corn. Why? If you watch many song birds while they feed at your feeder, you will notice that they often kick the corn out, on to the ground, with their beaks. Some birds just don’t like it. So we replaced the corn with fruit and nuts. We put cranberries in for Blue Jays and Cardinals. And we added peanuts, almonds and pecans, the result is a blend you love. Including chickadees, tufted titmice, house finches, song sparrows and morning doves.